After I told Arsen about Baby A., I decided that we could just keep the info between the two of us for awhile. I knew I found out super early, and I also knew that I didn't want to "announce" things until after the first trimester. We found out on a Friday, and we were supposed to be traveling to Oklahoma the following weekend for an OSU game, so I thought I would just wait and tell my parents then. Also, my dad's birthday was that upcoming Tuesday, so I knew it would be the best birthday present I could ever give him. So it was decided. We were waiting. Until the next morning. Arsen and I got up early and ran some errands, and by the time we made it home around 10 am I was dying to tell my mom. We had plans to go over to a friends place that night, and I knew there would be drinking, so I thought what better way to avoid an awkward situation where people were wondering why on earth I wouldn't have a drink than to invite my mom up and tell her that day? So I gave her a call and invited her to come have a "girls day" with me. Not suspicious at all, right? Randomly call on a Saturday morning and ask her to drive 4 hours for a day of fun. She said it didn't even cross her mind until she was halfway to Dallas that I might possibly have some exciting baby news to share. But, according to her, the minute I opened the door she just knew. Arsen was supposed to be leaving around 5 to go over to our friends place, but he really, really wanted to be there to tell her with me and see her reaction. Of course, since my mom is just like me, she was running a bit behind schedule. So it was almost 5:30 by the time she got into town and Arsen and I were both basically pacing the floor in anticipation. Since I was doing all of this on such a whim, I just pretty much re-did my presentation that I had for Arsen with a few Nana-specific items. I saw her pull up in front of the house, so I grabbed Addie and opened the front door. She was on the phone in her car, so she sat there looking at me while she ended her call, and Addie was fighting to get out of my arms because she saw a car out front and was ohsoexcitedshecouldn'ttakeit. So the minute my mom got out of the car and Addie saw it was NANA (her very favorite person) she leaped out of my arms and took off sprinting to her. This is my moms take on the situation: When she saw me standing in the doorway I was glowing and she just knew, and the reason Addie ran to her like that is because Addie also knew, and she wanted to be the one to share the news with Nana. This is exactly why Arsen always calls my mom a hippie. Her take on things is always interesting. A couple of days later we went to have dinner at Arsen's parents place. We had discussed beforehand whether or not we should tell Arsen's dad or not. We really wanted to keep things quiet for the first several weeks, and Arsen's dad really likes to share good news. With everyone. So we were a bit concerned. I said maybe we could beg him please to just keep it quiet until we said it was OK to share? Arsen was pretty sure he would just go ahead and tell anyway. So, we had to tell his mom quietly and tell her that it was just between us for the time being. 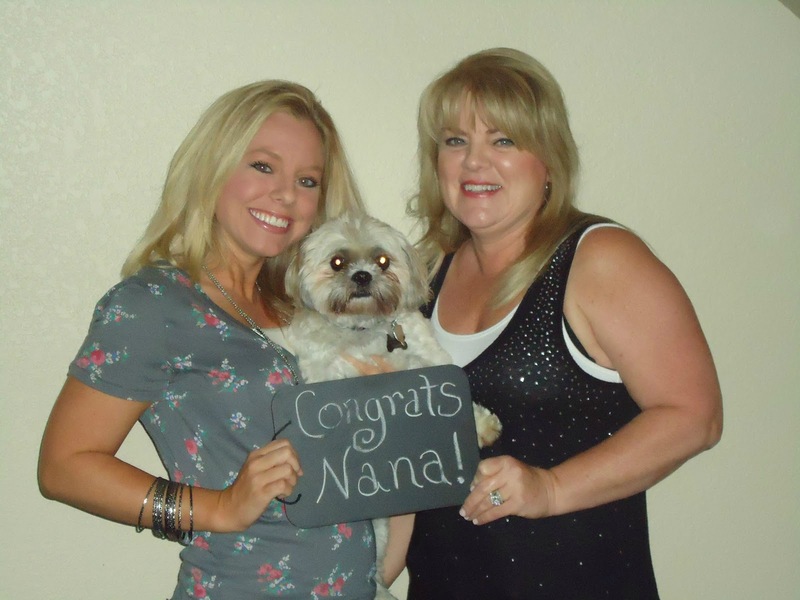 What a horrible thing to do to an expectant grandma, right?? So needless to say she was overjoyed, but she couldn't really express it because George was in the next room! That Thursday night we headed out to Oklahoma for the weekend. I had been wondering what the best way to tell my dad would be. I wanted it to be perfect. 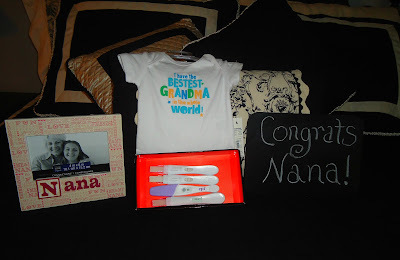 My dad is almost 70, so he has been ready for a grandchild for several years. He often has made comments about hoping he's still around to see his grandkids...don't let him fool you though, he seems 10 years younger than he is, so he's fine. I think he just liked to guilt trip me. So since his birthday had been that Tuesday, it was the perfect set up. I told him I had a birthday gift for him. He started opening things up, and I swear it took him forever to figure out what was going on. There was a baby blanket, pacifiers, and a frame that said "I Love Grandpa". His girlfriend Monie was there, and she said "Oh my God!". Dad was so confused and said "What?". She said something along the lines of "How on earth have you not figured this out? She's pregnant!!!". It was absolutely hilarious. He looked at me and said "Are you really? ", and when I said yes he sat back in his chair real fast and was very, very quiet for several mintues. I hate to put this out for everyone to read, but it was quite obvious that he was holding back tears. Arsen had been waiting for someone to cry, so I think he was pretty pleased with that reaction. After we had our first ultrasound and heard the heartbeat and everything we were comfortable with the news getting out. So the minute we left the doctor's office Arsen gave his dad a call. They were speaking in Russian, so I'm not sure exactly what was said, but it was a quick convo. Arsen said it was something along the lines of "You're going to be a grandpa!" and his dad said something like "Oh! Good, great news! ", and then yada, yada for a few seconds and goodbye. I asked if Arsen thought he was getting off the phone to call all of his friends and tell them, and he said most likely. Once all of the grandparents knew, and a few close friends, and obviously Arsen's siblings, I pretty much shut down telling anyone else until close to the end of the first trimester. Arsen was absolutely dying to tell everyone he knew, so it was a bit of a challenge for him, but he handled it well. I'm so glad we waited. I think it was special to have it just between us and a few loved ones for awhile. And it also made it more exciting when we finally got to tell. But I must say, what a relief it is to be able to talk about it now! Man, hiding it was so tough. All I have is baby on the brain...so coming up with anything to talk about that doesn't involve that in some way was a challenge. Alright, I've still got that whole constantly exhausted thing going on, so I'm off to bed! Goodnight friends. What a sweet reaction from your dad! Got me teary eyed! I got teary reading your dad's reaction as well! So sweet! Too cute! We had so much fun telling our parents. I always wanted to do it in a cute and fun way but ours was such a total surprise that I couldn't even think straight enough to come up with something creative. SO, we just told them all individually which was so fun. Everyone lost it. :) I'm so excited for you! OMG! Arsen's dad is just like Cody's grandpa. We told him super early on (like 6 weeks because he's in his late 80s and whatnot)...totally forgot that he's got the biggest set of loose lips around. We got a few random texts from Cody's friends back home that ran into him at his old man coffee group (Cody is from a super small town). Luckily nobody posted anything on facebook or I would have been a bit more upset. Haha God love him, but the man can't keep a secret if his life depended on it. The story was just precious!